From us here at the Knight ranch, we pray everyone had a wonderful time with family and friends during the holidays. Our Christmas and New Years involved us, as we do every year, alternating between both sides of our families. Thankfully, all of our immediate family live with in a 20 mile radius, so no long trips for us. Between Evan’s birthday and Christmas, he received an over abundant amount of presents. And out of all of them, I’ll share with you his top two favorites (at least for the time being). 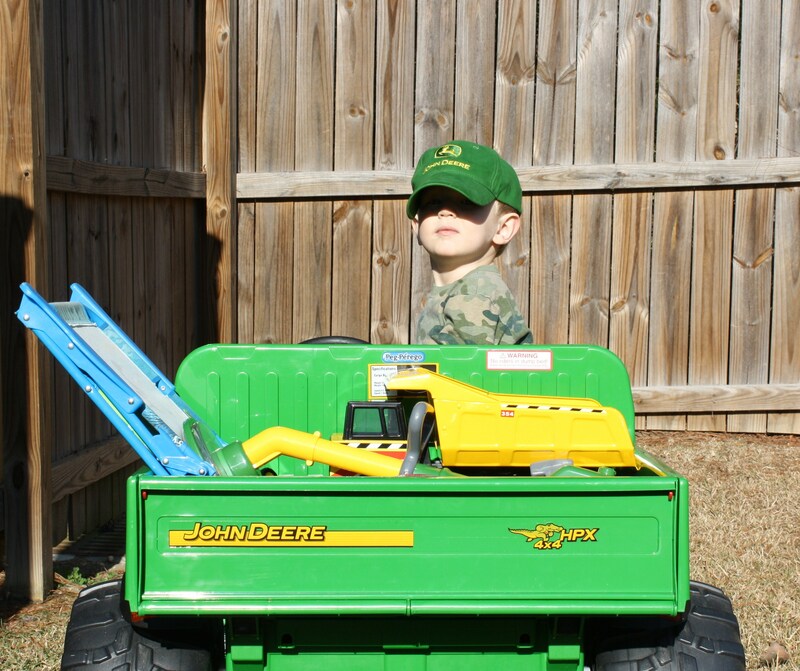 Lovebug and I got him a John Deere Gator for his birthday and he has become quite the driver. So much so, that he prefers driving from the passenger seat. The second gift came from my brother. Let me first make mention that Evan has an obsession with jelly beans. Not just any jelly beans, they must be the gourmet style Jelly Belly beans. The kid will practically do anything for one. 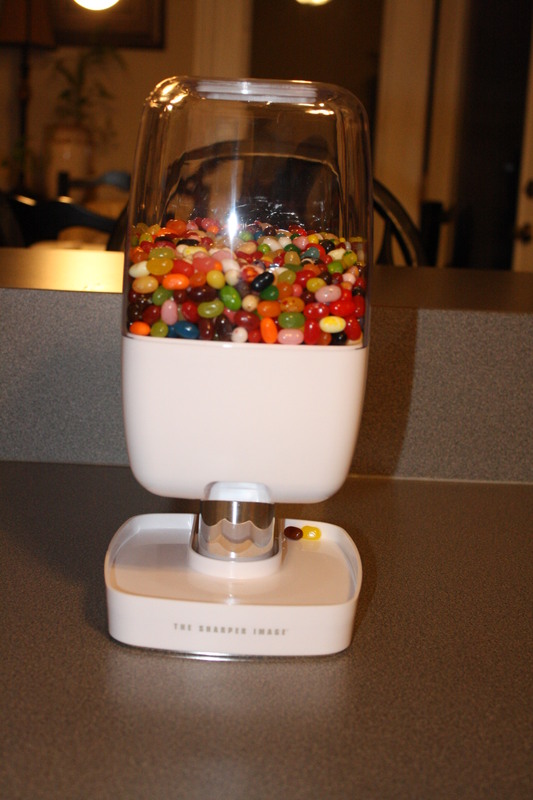 With that being said, his gift was this automatic dispenser filled with Jelly Belly beans! The automatic dispenser has been properly placed on top of our refrigerator and out of his reach. Unfortunately, it’s not out of his sight. We’ve already had many of meltdowns over these “beans”. It seems like every 30 seconds Evan is saying, “beans, pweez”. In order to help with all the bean meltdowns, I’ve recently tried a new parenting approach. I’m sure you might have heard of it before…bribery. It’s been working out pretty well, except for potty training. My goal would be for him to be potty trained before baby girl arrives, but as of now, it is still simply a goal. He would still much rather have a diaper on. Let’s be honest, sometimes I can’t blame him. I can relate. I had two simple present requests for Christmas. One of them being a bed pan. Yes, that’s right, a bed pan. Baby girl apparently knows exactly wear to kick during the middle of the night, right on my bladder. I’m telling you, frequent urination trips to the potty during sleep can really make you readjust your perception about the use of a bed pan. Needless to say, my husband was grossed out with the thought of sleeping next to urine, so he didn’t buy me one. I’ll continue on…next topic up for discussion is Lovebug. My Hero. On Monday, he had a second surgery on his hand. The second surgery was imperative because the first surgery was a failure. A HUGE FAILURE! This whole incident has been quite an eye opener for me. One can easily take for granted how important a body extremity can be to one’s daily function of life and how quickly life changes when that body part is broken or its use taken away. Lovebug broke his hand last summer (July) and most likely he won’t be fully healed until sometime this summer. I know that much worse could have happened the night of Lovebug’s incident, so in the grand scheme of things, a broken hand isn’t that bad. After it was all said and done, I’m truly thankful that he was able to WALK away with ONLY a broken hand. For whatever reason, this is our cross that we must carry right now. The Lord led us down this path and we must learn from it, while all along, give Him the praise and glory. Post second surgery picture. 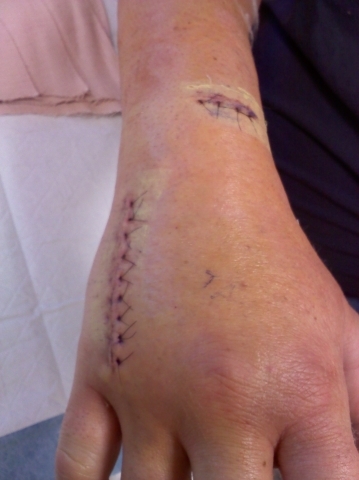 The new incision on his wrist is where the surgeon removed bone marrow from his ulna bone, then used that marrow to pack in between the two fractured bones. The old plates and screws were removed and new ones were installed. And because I would hate not to include baby girl in this family update…here’s what she’s looking like. Sorry for the cheesy bathroom picture. Last Monday marked 24 weeks. I gained 6 pounds last month for a total weight gain so far of 23 pounds. 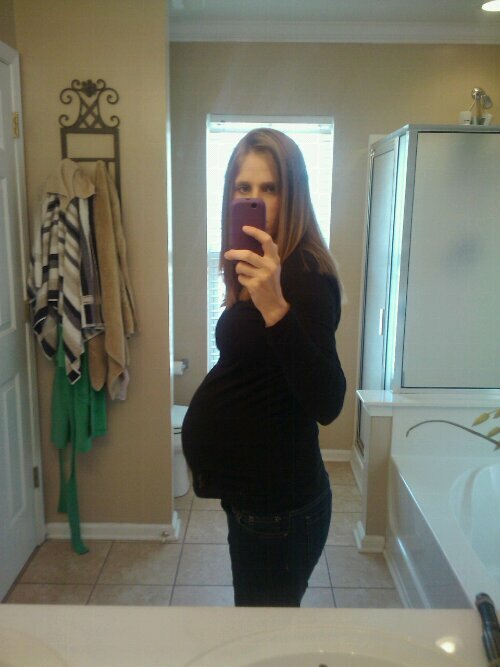 I am about 8 pounds lighter with baby girl than I was with Evan at this stage. Oh, and one more thing before I go. On my recent trip to Target, I found these in the dollar zone. Matching plate and forks for the little ones. I picked up two sets, one for Evan and one for baby. Just to clarify, the plates and silverware are sold separate. The plates are $1.00 and the silverware comes as a set (fork and spoon) for $1.00. What really got my attention were the dividers on the plate. 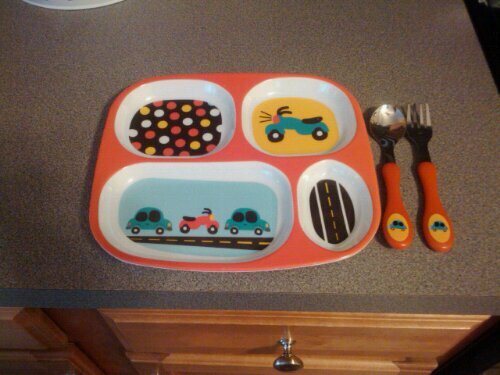 It’s hard to find toddler plates made like that, and for a $1.00. I was sold instantly!